We passed by Cara Mia Gelateria at Robinsons Galleria on our way home last night. Hubby wanted something sweet, and he saw pictures of their gelato shakes near the cash register. Thinking that each gelato shake would cost him less than 100 pesos, he ordered Sans Rival Irish Cream right away. He got the surprise of his life when he saw how much he was going to pay. 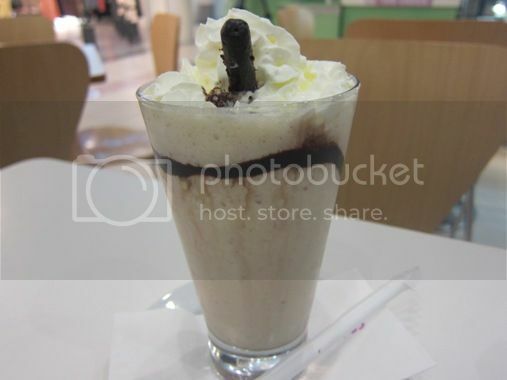 Well, I must say that this Sans Rival Irish Cream Gelato Shake was beautifully presented; don’t you agree? I had to take a sip to find out what this gelato shake tastes like. The rest was shared by hubby and our 5-year-old son. The little boy said it was yummy; hubby and I thought it was a bit too sweet, however. This entry was posted in Cara Mia Gelateria, Dessert, Gelato Shake, Robinsons Galleria, Sans Rival Irish Cream Gelato Shake. Bookmark the permalink.